World Antibiotic Awareness Week is November 12th-18th. During this observance, SIDP is highlighting members who promote optimal antibiotic use and combat the threat of antibiotic resistance in impactful and innovative ways. Briefly describe your international stewardship work. After completing my training in the United States, I was invited by a tertiary medical city to establish one of the first antimicrobial stewardship programs (ASP) in the western region of Saudi Arabia. This medical city had a high rate of multidrug-resistant organisms with heavy colistin and tigecycline use. After implementation of ASP, days of therapy for colistin and tigecycline were reduced by ~60% and 45%, respectively. Additionally, resistance to colistin in Acinetobacter baumannii decreased from 31% to 3%. After this first experience of ASP implementation, I went to the University of Arizona to complete fellowship in ASP as well as MSc in clinical translational research. I then returned to Saudi Arabia where I work as an Assistant Professor of Pharmacy at King Abdulaziz University. I currently collaborate with the Saudi Ministry of Health (MOH) for various ASP activities which include national policies, education and awareness activities, and assisting MOH hospitals to implement ASP. Recently, I was invited to complete class reviews of antimicrobial agents in Saudi Arabia and recommend changes for MOH drug formulary. I am also in the process of starting a pharmacy residency program in ID to expand the number of ID-trained pharmacists in the Middle East. Three years ago, I started tweeting through my “Antibiotic Tweets” twitter account (@khalideljaaly) through which I share continuous educational information, updates, and clinical cases about antimicrobial agents. 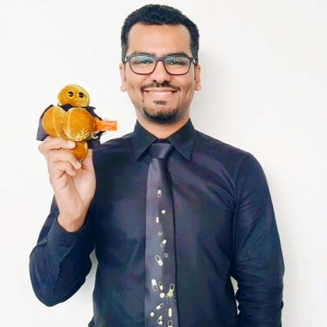 I provide many educational sessions and workshops in Saudi Arabia to raise antibiotic awareness, and have begun collaborations with researchers from Saudi Arabia, USA, UK, Belgium, Australia, Greece, and Taiwan to combat antibiotic resistance. What international stewardship initiative or antibiotic awareness effort are you most proud of that you have participated in or lead? I am very proud of collaborating with a new subcommittee under the Saudi MOH, called Antimicrobial Stewardship subcommittee. We successfully submitted a letter to the Minister of Health to implement a policy prohibiting dispensing of all antimicrobial agents without a prescription. This was a long-awaited decision, particularly since many studies have shown significant misuse of antimicrobials in various regions of Saudi Arabian community pharmacies. 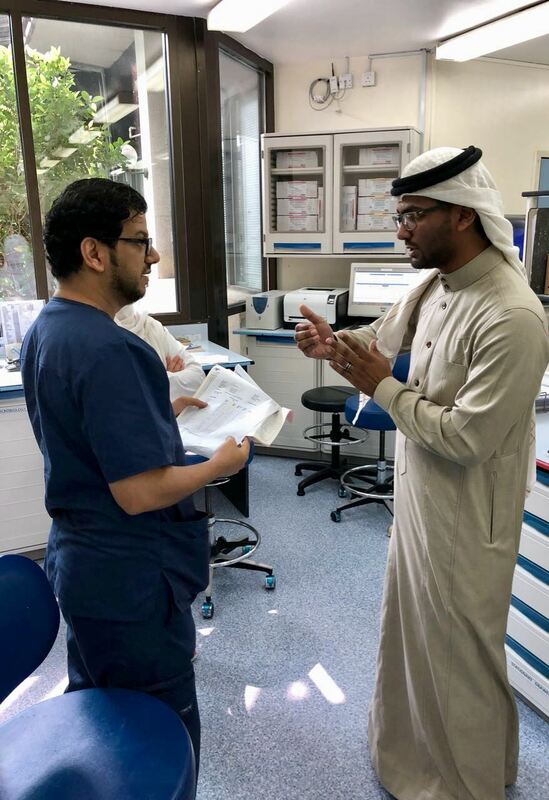 In addition, it was required for the first time that any Saudi Arabian hospital with 150 beds or more implement an antibiotic stewardship program. The members of our committee started by visiting ~30 hospitals and plan to track their progress using the CDC stewardship checklist. It was eye opening for me, and a great experience, to see the barriers to implementing ASP in different hospitals and discovering ways to overcome them. Moreover, we collaborated to prepare a national guide for appropriate use of antibiotics, which was distributed among the Saudi hospitals. Have you measured the impact of this initiative; if so, what has the impact been; if not what are you planning to assess and/or expect to find? While we have yet to assess the impact of the policy requiring a prescription for all antibiotics, I am excited to see the results and anticipate significant reductions of dispensing of antibiotics in community pharmacies. I look forward to seeing the trend analyses over time of overall antimicrobial agent dispensing for agents utilized for specific indications, particularly upper respiratory tract infections and gastroenteritis. In addition, ASP implementation should increase throughout my country with increasing adherence to the CDC criteria and best practices of antimicrobial use. I look forward to analyzing this impact. What actions can pharmacists take to optimize antibiotic use across the globe? I believe that in most countries, clinical pharmacy services are still very limited, and we should all work together to share our experiences with each other and to develop leaders in every country with adequate training. However, even without presence of specialized ID pharmacists, general pharmacists can make significant interventions. Still in many countries patients can obtain antimicrobial agents without a prescription and pharmacists should push against this misuse. It is great to see several online training programs about ASP such as those by SIDP, MAD-ID, CDC, and WHO. More online lectures and webinars are needed, particularly for countries with limited resources and experiences with ASP. Joining social media networks and interacting with each other has become very important. I also think telemedicine should be used in ASP on a global level. Finally, I would like to stress on the importance of initiation of hospital protocols and monitoring adherence, particularly in low-resource settings. These protocols can reduce burnout out of pharmacists and allow them to target areas of high priority in each hospital considering local data, including antimicrobial resistance. What is your primary goal for the next year to continue to improve antibiotic use? Enhancing my experience with ASP on the national level, helping more hospitals implement ASP, and conducting more studies to see the impact of our aforementioned interventions. I also hope to publish the experience of ASP in Saudi Arabia and Middle East, as very few studies are published from this geographical area. What is one pearl you have for non-ID trained pharmacists to help them be antibiotic stewards? You are PHARMACISTS and drug experts who work to optimize efficacy and safety of medications. This applies to antimicrobial agents too! You can be great stewards like ID pharmacists, and you can do most ASP interventions such as de-escalation, optimizing duration of therapy, therapeutic drug monitoring, intravenous to oral antimicrobial conversion, etc. ID pharmacists cannot monitor all antimicrobials used—we can do a much better job with your help and drug expertise to optimize patient care and save antimicrobials!